Oh yeah! That's self scanned by ME (me and only me) from my Katekyou Hitman Reborn megane's set (received for Christmas ith other amazing stuffs! YAAAAA! <3). Don't reupload it in othere websites and don't use it without my permission (simple sent me a pm and I'll answer you if you can), more of all DON'T REUPLOAD IT IN ANIMEPAPER! There is my name over the image so I'll recogniz if you'll do it. Won't you put the others? Is there no chance u'll upload the others for us as well? I LOVE HIM! HE LOOKS SO COOOL! 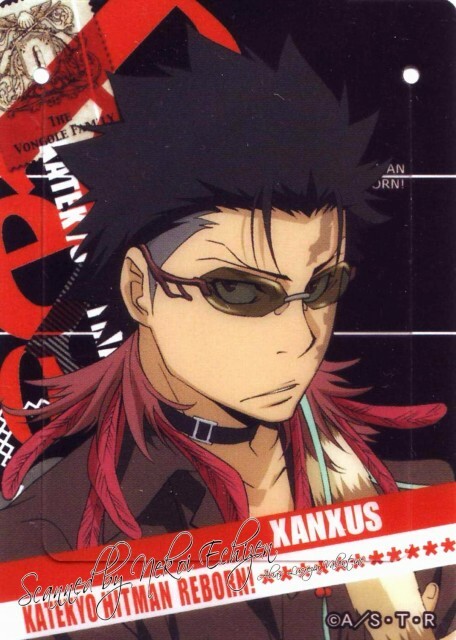 Wow, Xanxus looks really cool in this picture.